The Epson TM-U325 is a cost-effective choice for environments that need the benefits of both receipt and validation printing all in one space-saving printer. 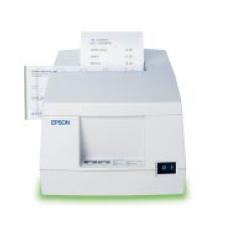 Fast and quiet, the TM-U325 provides crisp, clean receipts and handles up to nine lines of validation printing. The drop-in roll paper loading system enables easy paper replacement and the semiautomatic paper loading function reduces the work for busy operators. They are available in Epson Cool White or Epson Dark Gray. Multiple Interfaces available.